You are in a world made up of fairytales with the rabbit Looksley as your guide. Your aim is to discover all of the hidden shapes in each scene by tilting the DSi and lining up other, disconnected shapes to reveal them. The game uses the Nintendo DSi Camera to track where the system is in relation to your head, providing a perspective trick that allows the puzzles to be tilted and turned. 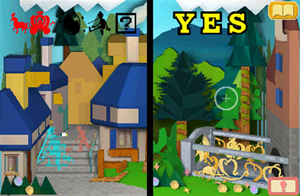 There are several stages to unlock through the game, plus secret shapes that aren't revealed to you straight away.